All the useful information that you need to know before sending money with Remitly! Remitly is an US Headquartered digital money transfer service. Customers can access Remitly.com on any device connected to the Internet. Remitly’s proprietary global transfer network includes what is described as an “easy-to-use mobile app”, which makes the process of sending money faster, easier, more transparent and less costly. This is accomplished by eliminating the forms, agents, codes, extra time and fees typical of the traditional, century-old money transfer process. It is a fast, easy and affordable method to send money online. Remitly is a digital money transfer service enabling international money transfers from the U.S.A., Canada & the United Kingdom to a select number of countries in South East Asia, Mexico and South America. It is a online only money transfer service that help the users send money from Mobile apps, tablets or mobile. Considering Remitly is providing digital services for sending money they offer a good alternate to the banks & remittance agents. Remitly offers a very user friendly online money transfer service that fast, secure and relatively cheaper than other money transfer companies. Pricing : How much does Remitly cost? The cost associated to transfer money through Remitly can be divided in 2 pieces, a flat fee and an exchange rate margin. Remitly charges a flat fees for sending money using its platform, the higher the amount your are sending the less the fees. In fact, above a certain limit the fees is reduced to zero. The second piece of the cost is the exchange rate margin. This is basically the currency conversion rate that Remitly is offering compared to the actual mid market or the interbank rate. Remitly doesn’t match the interbank rates but the margins are usually very low. Less than 1% in most cases, as analyzed by our team over a period of 2 months. For First time users though, the Exchange Rates are usually better than a repeat user. This is one of the key strategy for Remitly and it attracts a lot of new users to Remitly. Economy – Economy Money Transfers take more time to reach the destination country but offer a higher exchange rate and lower fees. Express – When sending money though express route the receiver get the money faster but since the exchange rate offered is marginally less than the other option. Also, if the transaction is done through a credit or debit card the fees could be substantially higher (1-3%) than the flat rate fee. Transparency: Does Remitly have any hidden fees? Second most important factor for Exchange Rate IQ users while evaluating any money transfer company tends to be transparency being offers by the remittance company. We hate hidden fees and charges so does our users. Remitly fairs very well on being transparent about its fees and charges. Even before logging into the website they clearly show the fees that would be charged as well as the exchange rates being offered. All exchange rates are Locked in at the time of transaction hence a user do not have to worry about any fluctuation in currency rates after a transaction is complete. Transfer Speed: How long does it take to send money through Remitly? Economy – Economy Money Transfers usually take 3-5 working days to. These transfers are initiated using a bank account. Express – Express transfers when done through a debit or a credit card could be completed in minutes. Transfer Times from USA, UK & Canada to Mexico, Philippines etc. is usually pretty quick like an instant transfer with the Express route. Although the express route can attract more fee and always offer a lower exchange rate than economy. For the same corridors with the economy option the transfer would be completed in 3 days with a better rate and lower fees. For money transfer from USA, UK & Canada to India if you choose economy, the fund transfer in bank accounts is completed between three to five working days. This usually depends on the receiving bank in India as well. For Express transfers from USA to India, a instant deposit is made to Axis & HDFC bank but for other banks in India the express transfer could take upto 4 hours. Security : Is Remitly Safe? Remitly clearly states that the user safety & security is their absolute priority. While we have seen reviews of the users complaining about the transfer times we never came across a negative review about the security of Remitly. Remitly also offer 100% Satisfaction Guarantee. If you are not satisfied with the services you can get your money back with charges & fees prior to the completion of the transaction. Remitly offers a very intuitive user experience on the website as well as the mobile apps. The overall process from registration, transfer and tracking is really seamless and easy to understand. A good UI & UX flow helps. A detailed FAQ section on the website answers most of the relevant questions. A chat & phone support is available for any other queries. Coverage: How many Countries & Currencies does Remitly support? Remitly is currently available in 3 countries to send money from, these are United states of America, Canada & United Kingdom. Remitly has recently started its services in United Kingdom. From USA it currently supports 8 Countries in Central & South America and 3 in Asia. Receiving countries in Central & South America are Colombia, Ecuador, El Salvador, Guatmala, Honduras, Mexico, Nicaragua & Peru. You can send money to India, Philippines & China from USA as well. From UK & Canada on the other hand you can only send the money to India, Philippines & China. Remitly has also partnered with local banks & Cash Pickup partners in all the receiving countries to help users collect the money conveniently. Remitly Partners in Philippines include over 10,000 cash Pickup locations and major banks. For India users can transfer funds to 100+ banks with instant deposits in HDFC & Axis bank and within 4 banking hours to ICICI, SBI and Citibank. Remitly’s Mexico network includes pick up locations like Bancomer, Elektra, BanCoppel, Bansefi and all major banks in Mexico. Como todo desconfiado la primera vez crei que no funcionaria, esta es mi tercera vez, envio dinero a chile y bolivia, y llega todo perfectamente lo mejor es que em dinero llega a la cuenta de la persona y solo se demora el tiempo que demora el.banco de destino en verificar el envio... esta genial, deje westerunion por remity... nunca doy este tipo de opiniones pero es que ests genial esto.. y te informa proceso a proceso...me ha ayudado mucho. I recommended remitly to a friend but now my friend wanted to make a transfer of 500 euro since 6 days ago 12/04/2018 , and the payment card has been debited and remitly did not process the transaction due to some document she was asked to provide and she couldn't, so remitly promise to return back her money since yesterday but unfortunately remitly has not done so, each time she try to check the status, they postpone the refund, please what is going on? Very trustworthy app.make my money transfer very easy thank you remitly..this is my 3rd time ..
delivered as promised. i sent 3 different times and money was received on the day as promised. Excellent service to send money to Mexico. 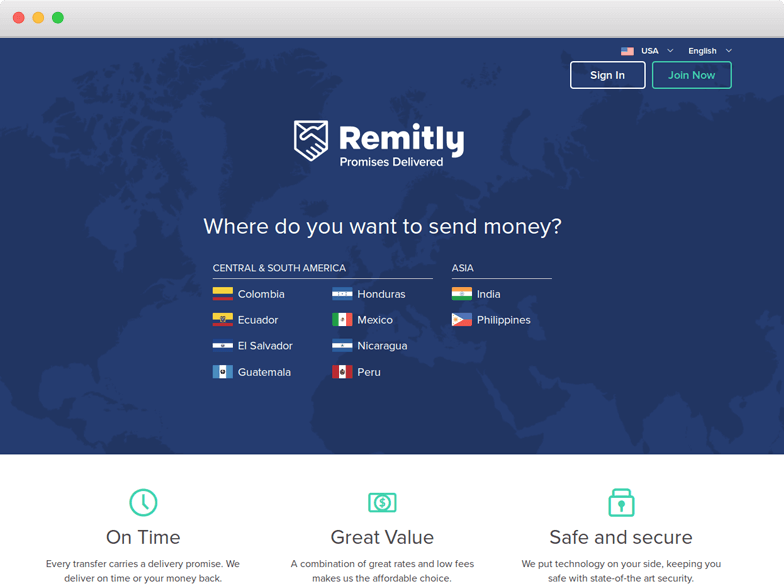 I would recommend Remitly to everybody that needs to send money to Mexico. Hello. Please I need my money back as soon as possible so I can try with another service. I sent money by bank transfer to your REMITLY account, I was promised that the recipient would receive it in nigeria, and you cancelled my transfer! Without returning my money! Please I need my money back! The best ever I am very happy ! Remitly is Best and gave me Bonus 15$ for Transfer !! Once the process is completed, Remitly will confirm a date & time by when the fund would be deposited overseas. After the completion of the transfer, you will reactive a status update & confirmation from the support team.